Live cloud transcoders take a single high quality stream as input and re-encode the video into 4 output streams at different resolutions and bit rates, allowing for smooth playback across device types and higher quality for those with better internet connections. Transcoders are typically available to use 5 minutes after starting. Beta Notice: The live cloud transcoder service is currently in beta. During this time, you will not be charged for usage. When the beta period ends, all accounts will be given an initial allotment of credits. Plus level and higher accounts will receive additional credits each month. Additional credits will be available for purchase. A minimum input video feed of 1280×720 with a 16×9 aspect ratio is highly recommended. If your equipment output is different, please contact us so we may provide assistance or adjust your account settings. 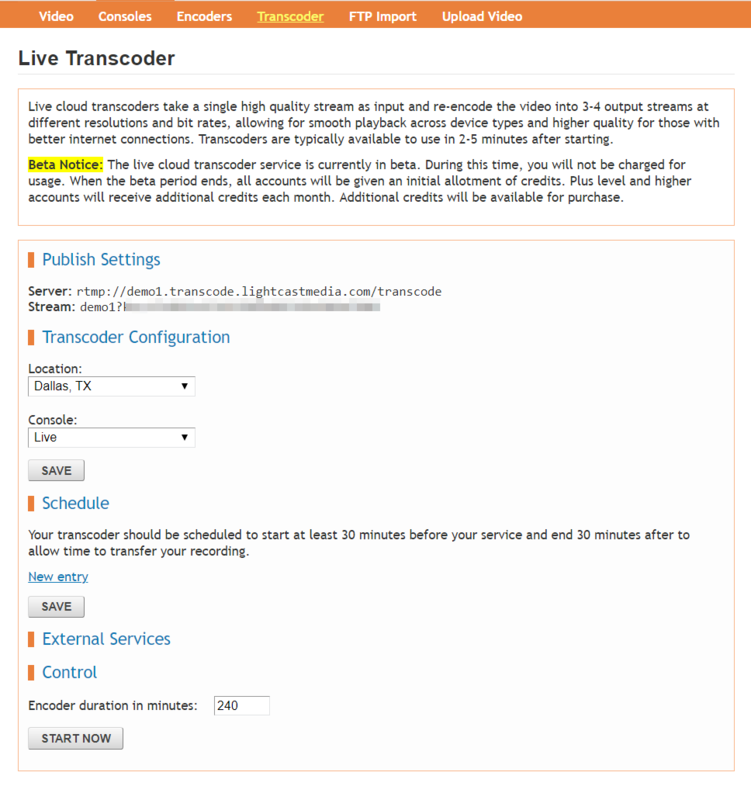 The live transcoder generates multiple output streams. The audio output will match your source (not re-encoded). The codec must be AAC. We recommend 128-192k stereo. You can also simulcast to additional services such as Facebook Live and YouTube. The cloud transcoder runs both on a weekly schedule and on demand. The transcoder must be running before you can begin sending a stream to be broadcasted. Under “Transcoder Configuration”, set the location to the city closest to you. Select the console you would like to broadcast to. If you have not created a live console before, one named “Live” will be created for you. Click “Save”. Additional options for schedule and control will be visible once this is saved. If you'd like the transcoder to start automatically before your services, you can put it on a schedule. Click “New Entry” for each scheduled service time. If you have multiple services with less than an hour between them, we recommend combining the service times. Although it normally only takes about 2 minutes to start, for best results you will want to schedule the transcoder to start at least 20 minutes before your service start time. You will also want to leave additional time at the end to account for a service running long or if you'd like your live video to be recorded and auto-uploaded for on demand and simulated live playback. The start time is in 24 hour format. The example below shows a Sunday service starting at 9:30am (with the transcoder starting at 9:00am) and a longer Wednesday service starting at 7:00pm (with the transcoder starting at 6:30pm). At the bottom, there is a “Control” section that allows you to start the encoder manually (not on schedule) or extend the running time in the event of a service running longer than expected.